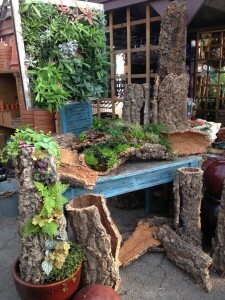 More Cork Bark Planter Inspiration – We’re Having Fun! The last post on these cork bark pieces was an inspirational hit for many of you, and, since we’re having so much fun with them, I wanted to share some more photos. We’ve reordered them a couple of times because they’ve become so popular. And what fun to plant!! 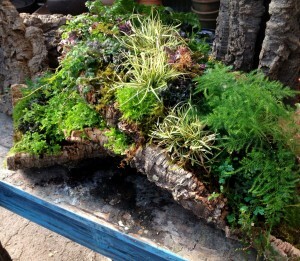 The first post focused on succulents, herbs and air plants – perfect for hot dry spots or areas that are hard to tend. The ones shown here are more woodsy in feel, very much in keeping with the bark material. The tall one that Jamie planted utilizes houseplants which work very well in shaded areas through the summer, and some perennials. 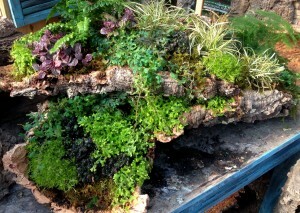 This piece will take filtered sun and clipping of the houseplants to maintain the balance of the planting. A pot was inserted in the bottom, planted, and then soil filled to the top, filling the opening all the way up to create a cool vertical piece. In the next planting, I took 3 of the flatter, rounded pieces and actually “stacked” them at angles, creating planting pockets and different levels and an overall shape I was pleased with. Next, perennials, including tassel ferns, ‘Metallica’ and ‘Burgundy Glow’ ajuga, golden and peacock selaginellas, Scotch moss and Carex ‘Evergold’, were added, creating sweeps of color and wispy trailers over the edges. An added bonus is that all of these plants are perennial and can be used in your landscape as they outgrow the container. Both of these have been lined before planting but will drain over the edges in the case of the stacked pieces and down through the bottom of the planting in the tall piece. We picture them in areas of restful shade, adding their green presence to woodland surroundings…We hope you enjoy our creations as much as we enjoyed making them! 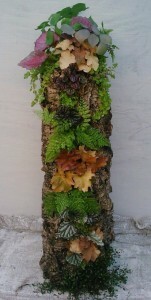 This entry was posted in Container, Ferns, Uncategorized and tagged bark pieces, containers, cork bark planters, corkwood arrangements, houseplants, perennials, planting, using cork bark pieces on April 6, 2013 by Kris Blevons.